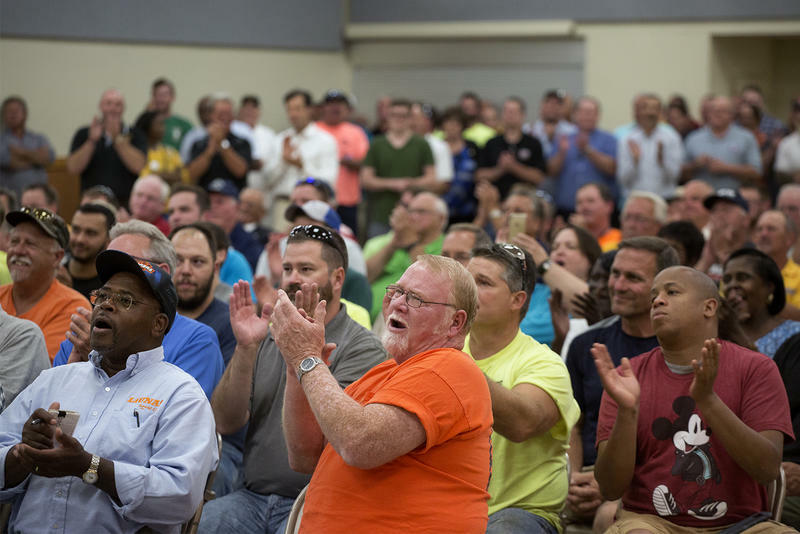 Union members gathered at the International Brotherhood of Electrical Workers Hall on Tuesday to notarize and turn in petitions to force a statewide vote over Missouri’s right-to-work law. (Revised Aug. 10 to clarify the activities of Americans for Prosperity) --It appears that Missouri labor groups will be able to block the state’s new right-to-work law from taking effect Aug. 28. They’ve collected more than 300,000 notarized signatures in the fight to force a statewide vote over the law in November 2018, state AFL-CIO president Mike Louis and other union leaders say. That’s more than three times the number needed. Missouri Secretary of State Jay Ashcroft has said the law can’t be enforced if it’s clear union leaders turn in at least 100,000 certified signatures. Louis told supporters at a rally this week that the signatures will be submitted on Aug. 18. “It really is humbling to know what you’ve accomplished will go down in the history books,’’ Louis said, emphasizing that the coalition has collected enough signatures in each of the state’s eight congressional districts even though they only needed to do so in six. But a tough fight is looming. A nonprofit affiliated with Republican Gov. Eric Greitens, who supports the law, has donated to at least one of the political action committees set up to defend the law. And the foundation arm of Americans for Prosperity, a conservative advocacy group, also is overseeing a statewide promotional campaign that includes mailers and digital ads. The foundation focuses on issue education. Right to work bars unions and employers from requiring all workers to pay dues. The governor and other supporters of the law say right to work will attract more businesses. The Missouri Chamber of Commerce lobbied to get right to work passed. President Dan Mehan wouldn’t comment on the number of signatures that have been collected, saying he wants to see how many actually get certified. But he is concerned that the law, signed by Greitens in February, will be stuck in legal limbo for more than a year.